BTW: This isn't being cynical, its the way everyone here felt. Courtesy of our favorite Cartoonist, Shay Charka. Just because it's the way everyone felt, doesn't mean that it's not cynical. Or stupid. There is nothing any government could do to prevent a hurricane (yet). Missiles coming from neighboring territory, on the other hand, can be prevented by appropriate and sustained military action. Since the Disengagement, we've heard tons of data regarding the number of missiles which came from Gaza, with the implication (often not so implicit) that the two are linked, and that we brought it on ourselves. To cry "victim" to the extent that it precludes any sympathy for towns wiped out by weather (as an aside, how long has it been since an Israeli town was physically wiped out by Arab acts of war/terror? ), when much of it could have been stopped by our own government, is the height of cynicism. I don't think Israelis can fully appreciate how powerful weather can actually be. An inch or so of snow brings cities here to a halt. Most Israeli couldn't begin to imagine what a hurricane is like, and the kind of damage it could cause. I was in Teaneck last week, which was relatively lightly hit, and "only" had damage from wind. It looks like a war zone. Israelis should shut up, count their blessings, and pressure their government to take care of their problems, instead of minimizing those of others. Yoni,was there a sale on stupid, that you bought so much? Shloma - What do you mean? Anything in particular which you found to be stupid, or do you just object to criticisms of the party line on spec, and think that ad hominem attacks are a reasonable replacement for high-minded and civil debate? I might have taken an emotional tone, but I provided something to back it up. Please extend me the same courtesy. jameel-seriously not cool & certainly not helpful, honestly. Yoni: I think you are somewhat misinterpreting the cartoon. The character in it is not "minimizing [the problems] of others"; to the contrary, she is expressing sympathy for them. Shloma: If you diagree with what Yoni said, then you should argue your points of disagreement. Ad hominem insults ("was there a sale on stupid, that you bought so much?") are not constructive or helpful. For the record, Yoni's main points are quite valid. The missle attacks on southern Israel are the direct result of a series of ill-advised, self-destructive Israeli policies during the post-Zionist era. First there was the withdrawal of the IDF from most of the Gaza Strip in 1994, as part of the Oslo process. Then there was the final, complete unilateral withdrawal of the "Disengagement" in 2005. Both of these foolish actions were undertaken in spite of obvious warning signs that they would result in a Hamas takeover of the Gaza Strip, and the exposure of southern Israel to terror infiltrations and rocket attacks. So, yes, it is quite accurate to say that Israel brought the current nightmare in the northern Negev upon itself. As Yoni points out, the situation there is therefore not very analagous to Hurricane Sandy, which was a natural disaster. As you correctly point out, the cartoon does seem to be sympathetic towards those affected by Sandy. I read it too quickly, as I have seen too many cartoons/comments by Israelis recently to the effect of, "why should we feel bad for you, we have missiles?". My response should be directed toward those cartoons/comments, not the one Jameel posted. 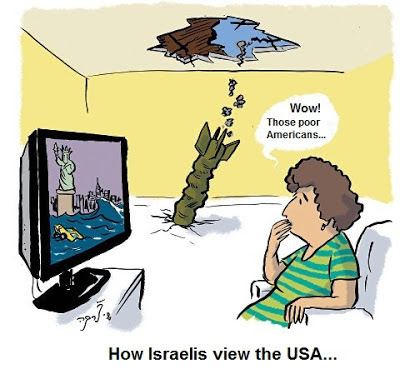 Follow-up: On second thought, the cartoon may present Israelis as being sympathetic towards Americans, but it seems to make fun of them for doing so, given their own problems. So I take it back. I viewed the cartoon as Israelis being sympathetic towards the US, while painting the backdrop that Israelis have their own problems as well (and its irrelevant WHY they have the problems). Ruthie: You totally miss the point of the cartoon if you find it "seriously not cool & certainly not helpful, honestly." Why be so cynical? This cartoon (at least the way I view it) as demonstrating Israeli sympathy/empathy, despite the daily problems we have to put up with (which are extremely serious and life-threatening).